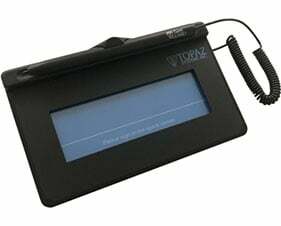 The Topaz SigLite 1x5 is a small, biometric electronic signature pad with signature capture touchpad, designed to be both space-and -cost-efficient. T-S460-HSB-R	 T-S460 SigLite 1x5, 1" x 5", USB interface. Includes software. The Topaz T-S460-HSB-R is also known as Topaz Systems	T-S460-HSB-R	or TS460HSBR	.